Where do all the ion channels come from? I would like to start off with a brief commentary about the current state of gene discovery in human epilepsy. Some of our readers rightfully took offense to my previous statement that gene discovery in epilepsy it over – quite the contrary is true, and I apologize for any confusion that I may have caused. Gene discovery in epilepsy is one of the few areas of human genetics with an ongoing, rapid sequence of gene discovery with a tremendous translational potential. But we also need to reconsider the name of this blog – we are far from being beyond the ion channel. The ion channel concept has made a remarkable return in human epilepsy genetics. Let’s find out why. 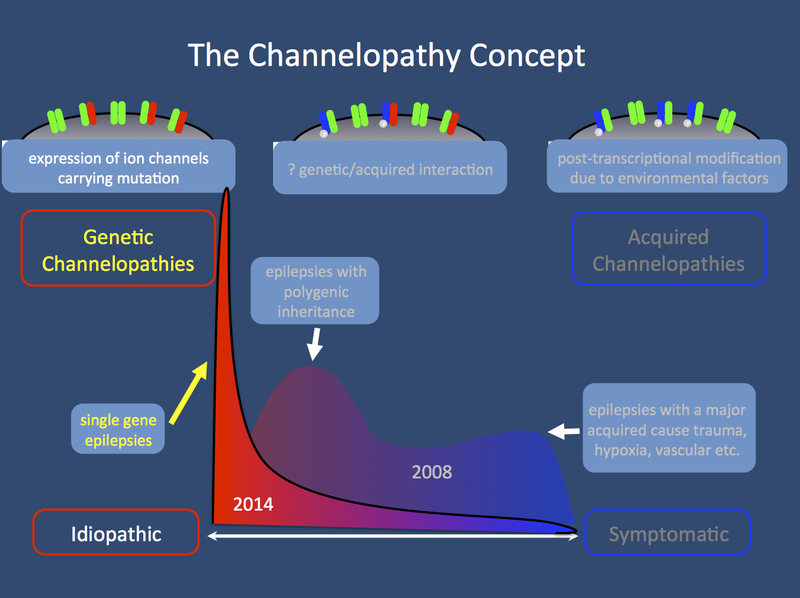 The Channelopathy concept 2008 and 2014. We have made remarkable progress in identifying ion channel gene mutation in monogenic epilepsy. This is much more pronounced than expected in 2008 and particularly the role of de novo mutations is surprising. However, there has been little progress in identifying the genetic architecture of complex genetic epilepsies other than finding several common variants through genome-wide association studies. Therefore, postulating that ion channel variants interact to contribute to the genetic architecture of human epilepsy is difficult, if not impossible to prove. The two stories. In fact, there are two competing narratives on why we are finally successful in identifying an ever-increasing number of genes for human epilepsies. One narrative implies that we were right on target to start with. It’s about ion channels when it comes to genes and epilepsy. Genes for ion channels were the first genes to be identified in familial epilepsies in the mid 1990s. And now ion channel genes re-emerged in exome sequencing studies. In the decade between, well, we just needed a bit more time. The competing narrative, however, goes as follows: after the initial successes in discovering genes for familial epilepsies, we were reluctant to change paradigms and almost needed a decade to realize that gene discovery in epilepsy required large-scale studies. After we managed to assemble a critical number of genotyped patient samples, we finally had success by numbers. In this narrative, the fact that ion channel genes have been rediscovered is an unusual coincidence, not a necessary consequence of following the right paradigms. Both narratives compete – ion channel supporters versus large-scale GWAS/exome supporters. However, neither narrative is entirely correct. How we got to where we are. I should admit upfront that I count myself to the fraction of the GWAS/exome supporters rather than ion channel followers – hence the name of this blog. I always felt that we were missing something by exclusively focusing on ion channels and that there are larger, as yet undiscovered paradigms out there that might tell a more comprehensive story about the underlying mechanisms of human epilepsies. However, to a sceptic, the recent discovery of ion channels is unusual. SCN1A, already the most prominent epilepsy gene, becomes one of the few single reliable genes in genome-wide association studies, and SCN2A, GABRA1, GRIN2A, GRIN1, GABRB3, SCN8A, KCNT1, KCNQ2 and KCNC1 are robustly implicated in human epilepsies. A sceptic would have a hard time arguing that the ion channel era is over. Ion channels, but which one? The search was not systematic and the ion channels implicated are not the channels that you might have expected. KCNT1 was thought to be restricted to the inner ear at some point, making it an unlikely ion channel candidate for a severe human epilepsy. In contrast, what has remained of CACNA1H, a gene coding for a thalamic calcium channel that would be an ideal candidate of an epilepsy gene? Sometimes, it feels like identified genes have been randomly drawn from a list of possible ion channel genes – this is in stark contrast to the sentiment that we are systematically chipping away at the genetic architecture and have identified basic mechanisms. However, it is difficult to envision an entirely hypothesis-free approach to human epilepsy genetics – ion channel genes are our anchor that we gravitate towards and will always be prioritized over other genes. Therefore, maintaining the narrative that the current success is due to numbers and technologies alone is difficult. Even the “stats people” are probably happy to stumble upon ion channels – it gives us a fixed point in our genetic solar system that does not exist for other diseases such as autism or intellectual disability. Also, it gives us quick access to model systems and paradigms to assess the functional consequences of a mutation – simply because the model systems are already there. The future. I am notoriously bad at predicting new trends, but let me give it a try. Within the last two years, we have finally broken through the sonic barrier of gene discovery in epilepsy and we will find many more robust genes for human epilepsies. Again, as in the last two years, there will be more ion channels that you would expect, helping us to tease out the genetic architecture of human epilepsies even better than before. Rather than stumbling in the dark, the channelopathy concept gives us a solid framework to work with and to modify. This – in my opinion – makes epilepsy gene discovery one of the most interesting and fruitful areas of human genetics for the years to come. This entry was posted in 2014, Bioinformatics, Epileptic encephalopathy, Opinion and tagged 15q13.3 microdeletion, channelopathy concept, de novo mutation, family-based trio sequencing, GABRA1, GABRB3, GABRG2, GRIN1, GRIN2A, HCN1, KCNB1, KCNC1, KCNQ2, KCNQ3, KCNT1, SCN2A, SCN8A, trio exome sequencing. Bookmark the permalink.